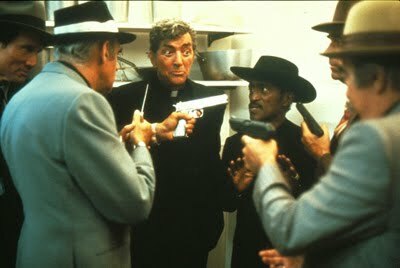 It's considered the third of four Rat Pack movies produced in the sixties, but in this one, only Frank and Dean represent the group, which is missing Sammy, not to mention Peter Lawford and Joey Bishop. Released in 1963, Four For Texas also featured romantic interests Anita Ekberg and Ursula Andress, and villain Charles Bronson, plus The Three Stooges. 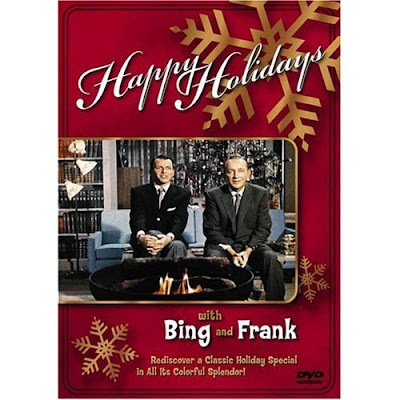 Frank and Dean play rival rogue types who join forces against a bad guy played by Bronson, and a corrupt banker played by Victor Buono, who also appeared in the final Rat Pack film, Robin and the Seven Hoods. Other cast members in small roles are some actors known to movie and TV fans. 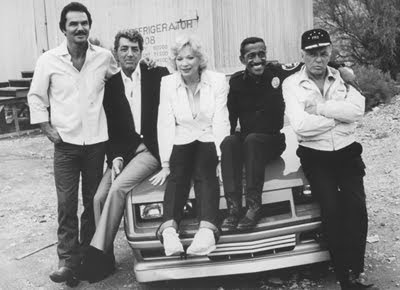 They include Yaphet Kotto, who starred as a James Bond villain in Live and Let Die, Richard Jaeckel of The Dirty Dozen, and Ellen Corby, who played the grandma on The Waltons. 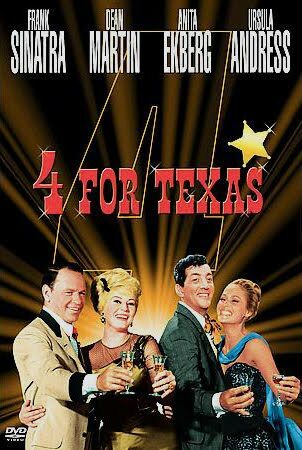 One more credit of note involved the Four For Texas music score, which was created by Frank's favorite arranger, the great Nelson Riddle. 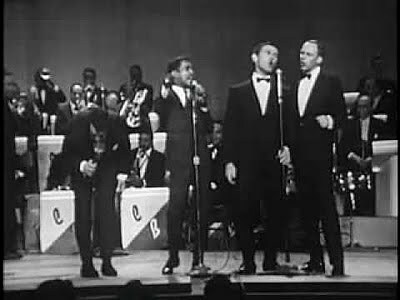 When the Rat Pack performed, in addition to songs and jokes, there were often some celebrity impressions thrown into the mix. Dean did pretty good impressions of Clark Gable and Cary Grant, and Frank played around as James Cagney. But the real impressionist in the group was Sammy, who did some spot-on imitations, both talking and singing. But when it was time for the impressions, Frank and Dean pretended to make it hard for Sammy, by inviting him to the microphone and then cutting him off. They're seen needling Sammy this way during the Rat Pack benefit show filmed in St. Louis that's available on DVD. 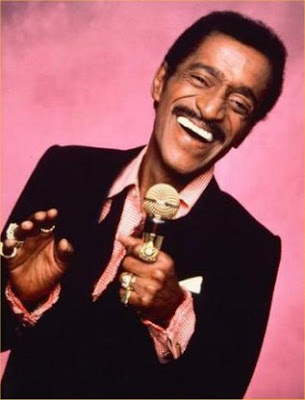 When Sammy did his impressions, they included great imitations of singers like Tony Bennett, Vaughn Monroe and Nat King Cole, with the crowning touch being his singing impressions of both Dean and Frank as they looked on. 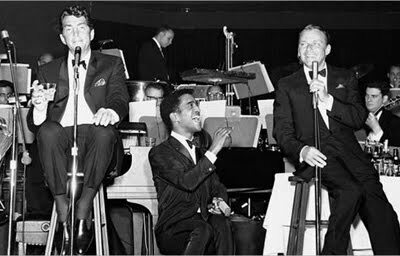 Today, you'll see impressions of Frank, Dean and Sammy performed by Rat Pack Impersonators. Labels: dean martin, frank sinatra, rat pack, sammy davis jr.